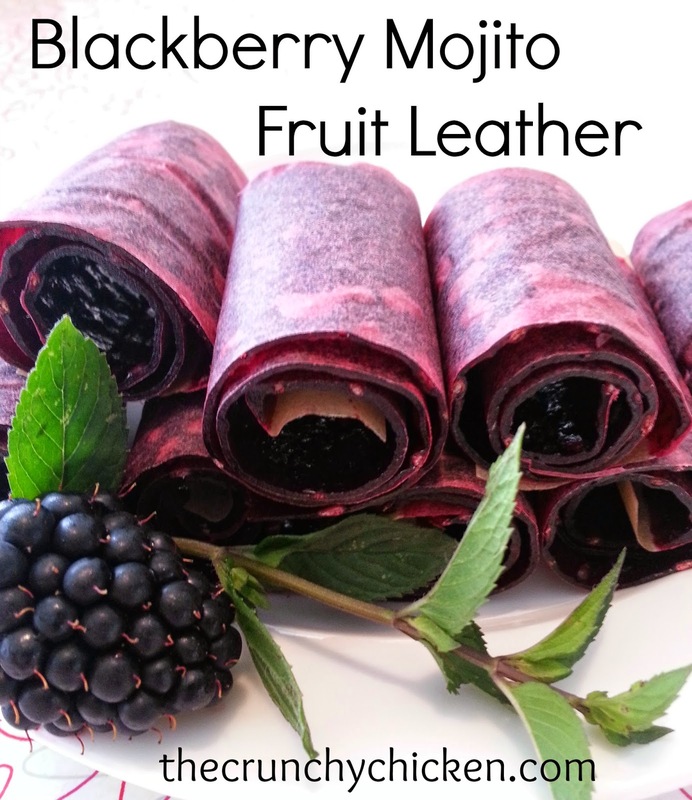 If you have tons of blackberries you are trying to preserve, like to drink mojitos and don't mind chewing your fruit in a gummy format, then this fruit leather recipe is for you. And, yes, it does contain rum. However, since it's cooked, the alcohol burns off, so you can safely feed these to your kids without worrying that you're a bad parent. Feel free to halve this recipe. 1. Preheat oven to 170 degrees F. Place blackberries and mint leaves in a large pot over medium-high heat and cook until blackberries release their juice and fall apart. About 10 minutes. 2. Remove blackberries and mint from the heat and run the mixture through a food mill to remove seeds. If you don't have overly seedy blackberries and don't mind mint flakes in your leather, then you can skip this step. 3. Return strained blackberries to pot and add applesauce, honey, rum, lime juice and lime zest and return to a boil. Simmer for 5 minutes. Taste mixture for sweetness and add more honey if your berries are too tart for your liking. 4. Remove pot from heat and let cool for about 20 minutes. 5. Line two 11" x 17" baking sheets with parchment paper. Pour 1/2 of the puree onto each sheet and spread thickly and evenly with an offset spatula. Put into oven and bake for 6 hours or until no longer wet. 6. With a pizza cutter or kitchen shears, cut the paper in half. Cut the sheets into 2 inch strips and roll up. Store in an airtight container. Obviously, don't eat the parchment - peel the fruit off. I actually DO tons of blackberries I'm trying to preserve, like to drink mojitos and don't mind chewing my fruit in a gummy format.. With rum ;) These look outstanding my friend! What an interesting and unique way to use up excess blackberries. I bet these are delicious. Thank you again for sharing at Green Thumb Thursday! Do you think this recipe would be good with red raspberries? Ever tried berries other than blackberries? If one wanted to use sugar, instead of honey (I'm allergic to honey), how much would you recommend? If you use a dark rum like Myers, Kraken or Black Seal, the rum flavoring really comes through!